The UK Biochar Research Centre seeks to provide an evidence base to support the rational deployment of biochar for the primary purpose of climate change mitigation (particularly carbon abatement), while being driven by an understanding of how the most value can be added to it in terms of soil function. The perspective is UK-focused, but given the nature of the climate change problem, and the effect of the environment and context on the value and impact of biochar, the tools and frameworks that are being developed have a global applicability. The Centre was set up in 2009 with core funding for five years, sponsored by the Engineering and Physical Sciences Research Council (EPSRC) in an initiative that also tackles chemical capture of CO2 from power station flue gases. The award was made to the University of Edinburgh, School of GeoSciences, and headed by Prof. Stuart Haszeldine. Three academics were appointed in Edinburgh to lead the research of biochar from the angle of soil science (Saran Sohi), social science (Simon Shackley) and biomass pyrolysis (Ondrej Masek) – and together, with help from the University, created the UKBRC. As well as being inter-disciplinary, a key characteristic of UKBRC is that it is a network that from the outset sought to draw in research teams around the UK, who had significant funded research activity around biochar. In the first instance this comprised researchers at Rothamsted Research, an agricultural research institute in southern England (sponsored by the Biotechnology and Biological Sciences Research Council, BBSRC), and University of Newcastle in the north. This ‘network’ perspective is reflected in the annual UK meetings that have been organized by UKBRC, and which have so far rotated between venues. In both 2009 and 2010, these events attracted over 100 delegates. With the expansion of biochar research in general, the alliance that comprises UKBRC will be reviewed in the near future, together with structured research partnerships internationally in Brazil, China, Ghana and Japan. In Edinburgh, the additional resource that came with the core grant resulted in a second phase of recruitment during 2009, in the form of post-doctoral researchers and PhD studentships. However, much of the infrastructure development – some of which was funded by the Scottish Funding Council (SFC) – and funding for additional staff and students reflects a series of external and University awards during the first 18 months of the Centre’s existence. By October 2010, the total staff and students working full-time on biochar in Edinburgh will be 20. A key output arising from the first year of the Centre was the publication of a report , ‘An assessment of the benefits and issues associated with the application of biochar to soil’ to the UK Government. This reported both to the Department for the Environment, Food and Rural Affairs (DEFRA) – and to the Department of Energy and Climate Change (DECC), who lead at the policy level. The report included results of a life cycle assessment for pyrolysis–biochar systems (PBS) in the UK context, as well as an updated literature review on soil impacts and an assessment of the regulatory position with regard to application to agricultural land. It included some “best estimates” for break-even price for biochar under current conditions, which provides context for the type of biochar products that will be required, or target systems for deployment. Also during the first year, a literature review was published in Advances in Agronomy journal. Other activities during 2009–10 revolved around creation of infrastructure for undertaking research in the pyrolysis and soil science areas, both of which feed back into the systems work in the social science domain. Critically, segregation of practical lab-based and engineering research from the evaluation of the wider systems has been avoided. 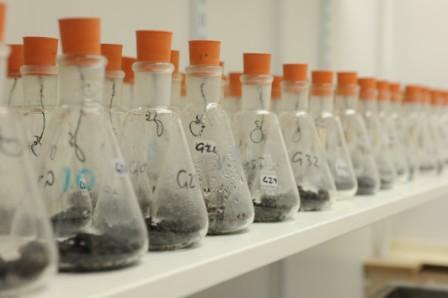 The University supported refurbishment of a dedicated laboratory block, where carefully specified biochar is produced and analyzed, and which is also used for the screening and assessment of biochar products in soil. The screening work extends into studies of interactions between plants and biochar below-ground, in a specific topic around soil–plant–biochar interactions in the rhizosphere (root zone). Other activities in PhD research are focused on the issues of contaminant creation and elimination during pyrolysis, and an examination of how apparent beneficial impacts of biochar on trace gas and nutrient leaching can be harnessed to best effect in livestock-based agriculture. One of the initial priorities in soil science, however, was to create the tools that allow for screening of biochar products according to the many functional properties that it exhibits in soil. These are relative measures of contrasting functions that in the field are exhibited over contrasting timescales. The objective is not necessarily, in the first instance, to create quantitative predictions of impact – as we already know that some types of biochar have large impacts in some situations – but a way of objectively comparing one type against another, and to unpick the scatter that exists in the meta-analyses for gross impact of biochar on, for example, crop yield. This means in-lab, targeting one function at a time and removing the effect of extraneous factors in the assessment assay. The most critical tool of all, which assesses long-term stability, was a particular challenge as it had to operate on the same (fortnight) timescale as the others – and for the same cost (each tool has been developed as a $200 test). 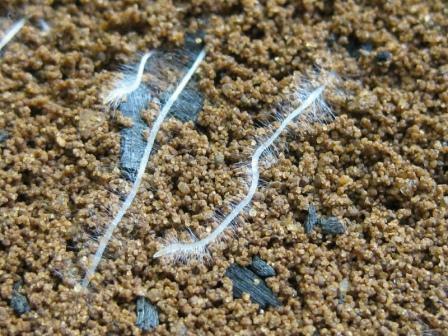 However, it is clearly critical to the very basis of the biochar proposition. 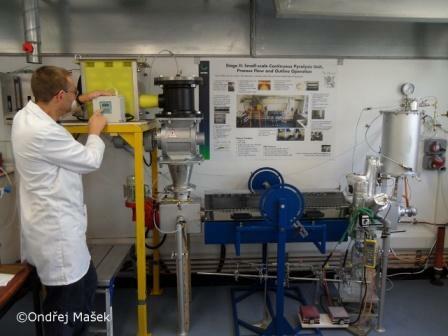 During the past six months an order was also placed for a pilot-scale continuous-feed pyrolyser and a building to house it, right on the University of Edinburgh’s King’s Buildings site. This development is funded by the University and two of its benefactors Derek and Maureen Moss, and situated directly next to the biochar laboratories, which themselves are just a few yards from the UKBRC offices. The horizontal, indirectly-heated kiln has been designed to flexibly and precisely process a diverse range of biomass into “specified biochar” at a rate of 50 kg/hr, with the complete unit expected for delivery in November with grand opening of the facility as a whole during Spring 2011. 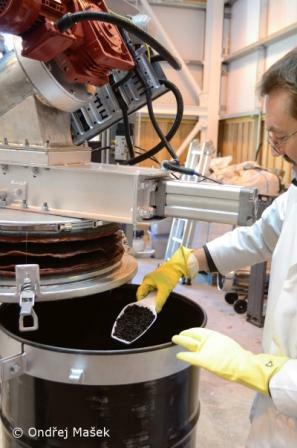 By then it is expected that the “Stage III” unit will be providing both UKBRC projects and the international research community with a much-needed source of reliable and realistically-priced biochar product, including a carefully defined range of “stock biochar” for reference purposes. The development of the “Stage III” pyrolyser is a key step toward the ultimate goal of not only predictive, transferable understanding of biochar function in soil, but also the baseline data on energy balance as affected by scale, as production moves beyond the lab bench and several steps further toward commercial technology, if this proves to be desirable. This will signal the beginning of the shift in emphasis from gaining basic knowledge and definition of assessment tools, toward providing practical guidance for the application of biochar into particular deployment situations. In this, core expertise in the practical and logistical constraints to deployment, including economic and socio-institutional barriers becomes highly important, and ensures that the UKBRC research program will continue to evolve, supporting the activities of IBI and the IBI community. 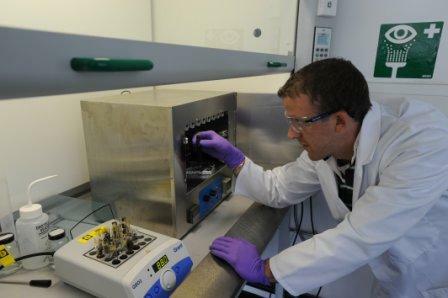 Rapid screening assay by Andrew Cross; Image copyright © Peter Tuffy Photography/The University of Edinburgh. All rights reserved. Direct observation and assessment of root-biochar interactions by Miranda Prendergast-Miller; Image copyright © Peter Tuffy Photography/The University of Edinburgh. All rights reserved. 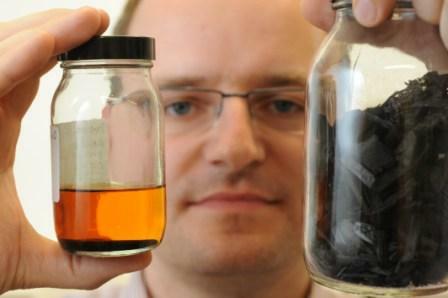 Ondrej Masek with biochar and condensed liquid from the Stage I facility; Image copyright © Peter Tuffy Photography/The University of Edinburgh. All rights reserved. Andrew Cross undertaking screening of biochar for stable carbon; Image copyright © Peter Tuffy Photography/The University of Edinburgh. All rights reserved. Dr. Peter Brownsort with biochar produced in pilot-scale slow pyrolysis unit. Image copyright Ondrej Masek. Laboratory continuous pyrolysis unit (1kg/h). Image copyright Ondrej Masek. 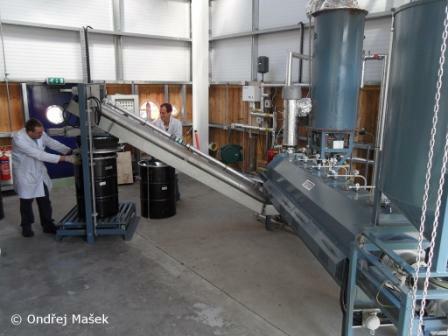 Pilot-scale (Stage III) pyrolysis facility at the UKBRC (50kg/h). Image copyright Ondrej Masek.